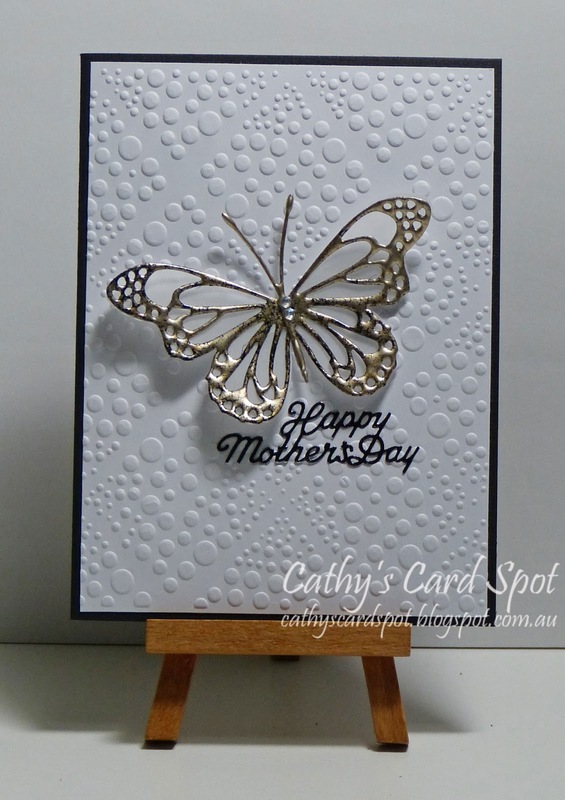 Cathy's Card Spot: Aged silver frantage butterfly. Hi everyone, it's a while since I embossed a butterfly with frantage. I've used aged silver for this one and have diecut the butterfly base from vellum. At Make My Monday, the theme is embossing, wet or dry. I've used both here. Simon Says Stamp Wednesday where it's anything goes. Simon Says Work it Wednesday has a Mother's Day theme. Outside the Box has a butterflies, insect or dragonflies theme, and you must use a Memory Box product on your project. I've used the Lunette and Oriel butterfly dies. Memory Box lunette and oriel butterfly dies; veramark ink and aged silver frantage embossing enamel; Ultimate Crafts mosaic constellations embossing folder; vellum; sentiment sticker. Perfection! The embossed background compliments the butterfly beautifully! Thank you for sharing this with us at the Simon Says Stamp Wednesday challenge! Beautiful Mother's Day card, love the embossed background with the butterfly. This is just stunning. I love that butterfly and the embossing folder is perfect for this card. Great job. Love that butterfly against that fabulous embossed background and the finish with the thin black frame. Simpleeeeeeeeeee stunning. Beautiful cas card Cathy. Both the colors and texture of the card are extremely elegant. I love the delicate butterfly pressed in old silver on vellum. It looks so amazing and airy. A very beautiful card, Cathy! Beautiful card! Your butterfly is fabulous. Thank you for sharing the details.